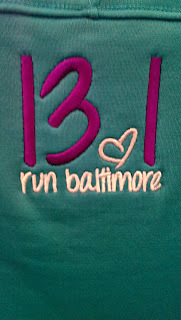 Being born and raised near Charm City, the Baltimore Running Festival holds a very special place in my heart. This event has something for everyone: kids races, 5k, half marathon, full marathon, marathon relay. 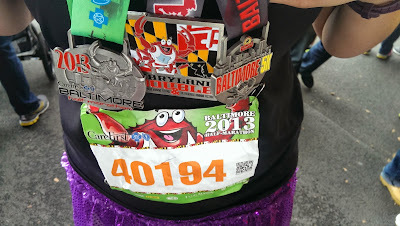 Last year, I completed leg #1 of the marathon relay (4 legs total) and this past Saturday I decided to tackle the half marathon. 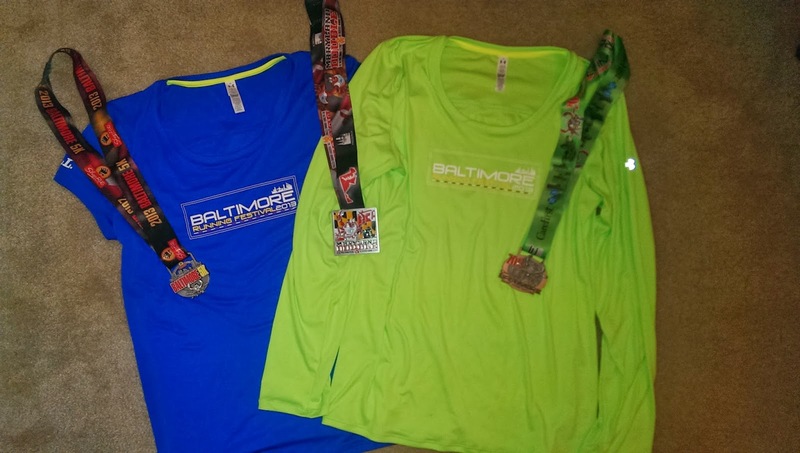 By completing both the Frederick Half (May 2103) and the Baltimore Half in one calendar year, I would also earn the Maryland Double Medal. If you know me at all, then you know I'm motivated by bling. 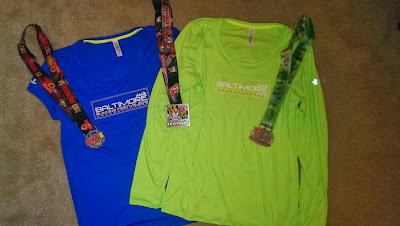 So, adding a second medal by completing the Baltimore half was a no-brainer. Now, Matthew and I also had 17 miles on the calendar for our Dopey Challenge training for this weekend. 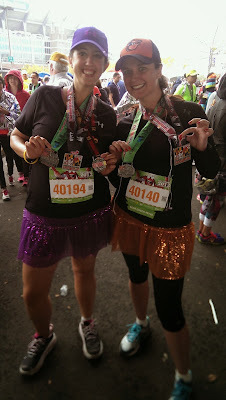 Naturally, when presented with the option to complete the 5k (8 am start time) and the half marathon (9:45 am start time) on Saturday, we jumped at the chance. Expo and Premiums- This expo was incredibly enjoyable. 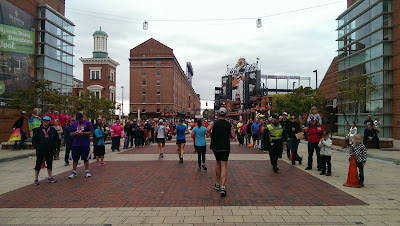 Free parking, well-organized, and lots of vendors including a few of my favorites- Hoka One One, yurbuds, and Charm City Run. We picked up our awesome premiums (see below), got some free under armour shoe laces, walked through the vendors and were on our way in less than 2 hours. Shirt exchange was convenient and well-stocked. The official merchandise was pretty amazing (there will be more available online later!) but I managed to get out of there with only a pair of feetures elite light cushion socks. More on them later. Short sleeve for the 5k, long sleeve for the half. Also, some pretty cool medals. Just a sample of the official merchandise. Course- I loved this half marathon course. It went through some of Baltimore's most beautiful neighborhoods, Lake Montebello, and culminated in an exciting finish through Camden Yards. Yes, this course in notoriously hilly, but to be honest I did not notice the hills. Maybe it's because I've been running a lot or maybe it's because I have been training on hills but I really liked this course and didn't think it was incredibly hilly. The 5k course was also enjoyable, hilly, and quick! It had the same finish line as the marathon and half-marathon so that was pretty cool to cross the same finish line twice in one day. Also, there was food provided at the 7.5 mile marker of the half. Not just gels, but actual food- bananas, chips, etc. which was much needed. 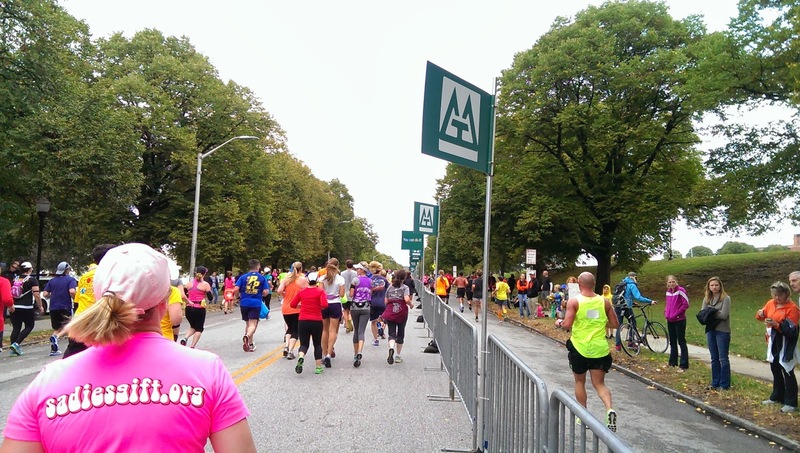 It's important to note that the half marathon course joins with the marathon course at mile 3 of the half, mile 16 of the full. 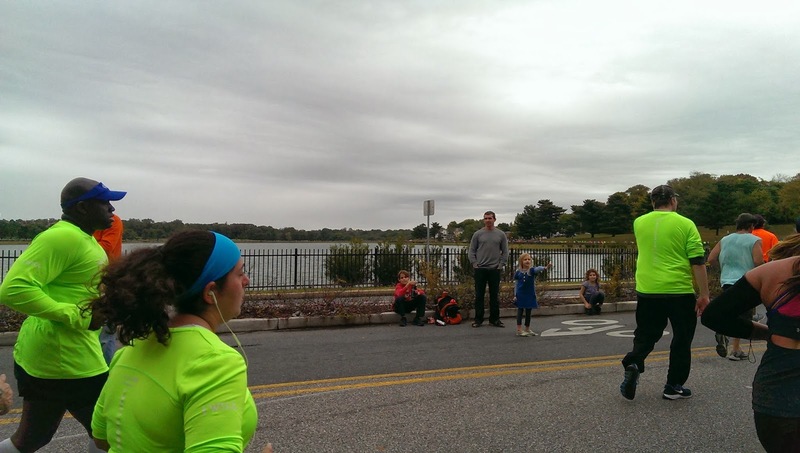 We were running with the full marathoners for their last 10 miles- so inspiring. Since I'll be running a full in just a few months, it was really motivating to be among people who were so close to completing their goal. 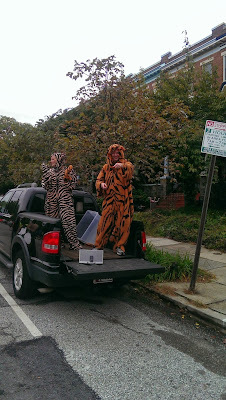 The "M&T Merge Mile." 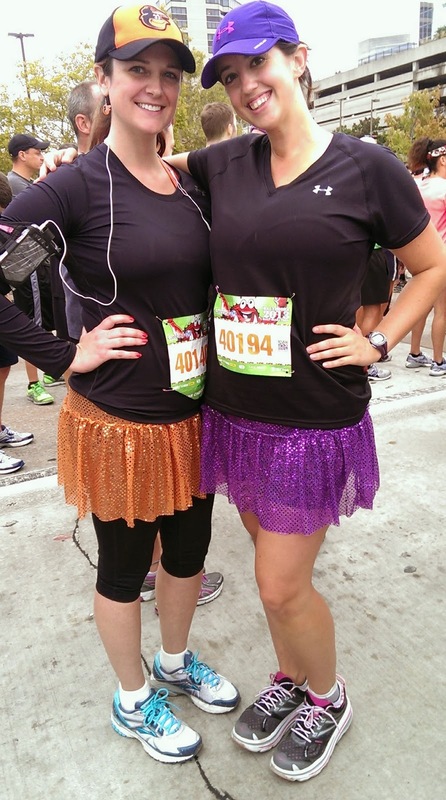 Half marathoners on the left, marathoners on the right. About .25 miles from the finish line! "Stop whining. 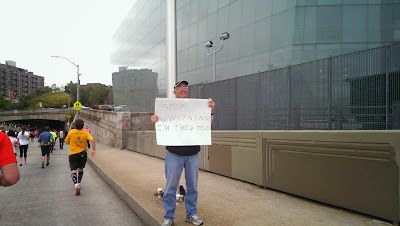 I'm tired too!" 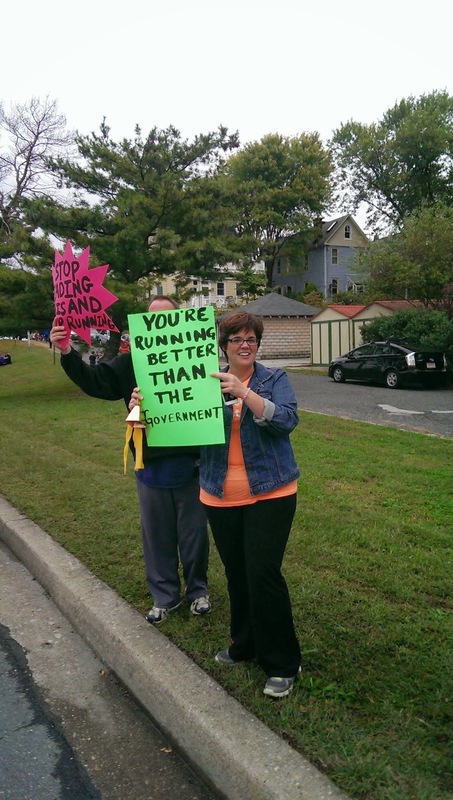 "You're running better than our government"
"We're strangers but I'm so proud of you." ﻿Company- My friend Kelly and my boyfriend Matthew both ran this race for time and finished about 35-40 minutes before I did (way to go, speed racers!!). Knowing that I was going to be alone for this race, I had my music and was ready to just cruise along and get my medal. 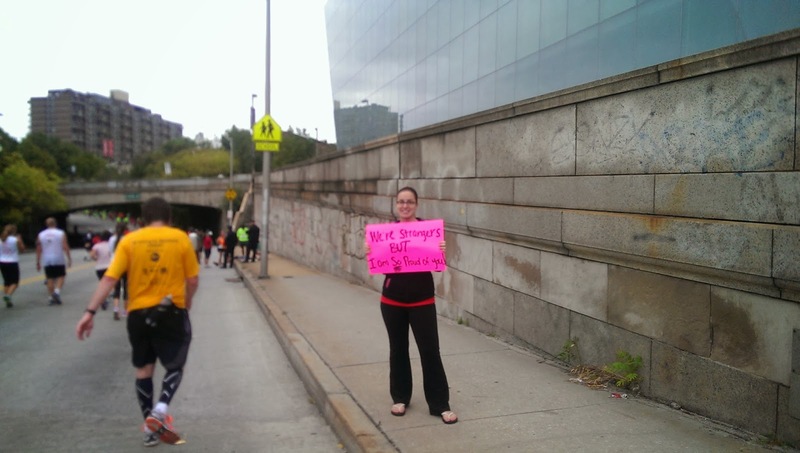 But as luck would have it (and because I'm a ridiculously social runner), I met a new friend around mile 5. I saw a woman with a shirt on that said "Let nothing stop you" on the back. During one of my walk breaks, I walked up next to her to tell her how much I loved her shirt. We chatted for a few minutes and I learned that this was Nikole's first half. She asked me about my walk/run interval and the next thing you know, we were running this race together :-) I can't describe how cool it was to run with someone during their first half. I still like to think of myself as a new runner but I'm starting to realize I may be more of a veteran than I thought: at one point, she asked me "Are you even sweating?!?" Though she couldn't tell, I was struggling a little with this race. I had run about 14 miles this week leading up to the 5k/half so I was running on tired legs. Talking with my new friend Nikole helped distract me from the pain and encouraged me to slow down and enjoy this experience. So, thank you Nikole, and congratulations! Post-race- After finishing both races, the lines for food were insanely long. I grabbed my medal (from a pile on a table- more volunteers needed to hand out medals! ), got a bottle of water, and walked out of the Runners Village to go find my friends. Also, we had to wait in line over in Celebration Village (vendors, bands, food, etc.) to get our Maryland Double medals and again, this was a ridiculously long line. Everything else about this race was so well-organized. Take a page from the run Disney handbook- pre-package the food so it's easy for runners to grab and make bibs for different races/challenges so different medals can be given out at the finish. New socks- I know better than to try new things out on race day. However, as it was going to be a rainy half and I wanted to wear a thinner pair of socks, I bought a new pair of feetures at the expo. The result? Blisters. Ugh, at least they aren't TOO bad. Half marathon start- After finishing the 5k, we had to walk about a quarter of a mile to the start line of the half, including crossing over the marathon course. Now, this is risky in any race to try and cross the course but with this many people, it was dangerous and (I think) rude. I hated having to run across the course to get to the half start. I don't know if it's always like this but I sure hope not. 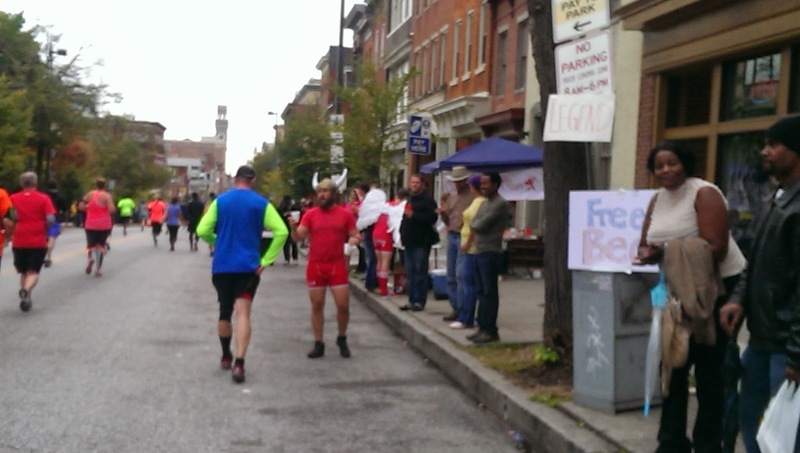 If you are looking for the amenities of a large race with the feel of a local race, then you should run Baltimore. 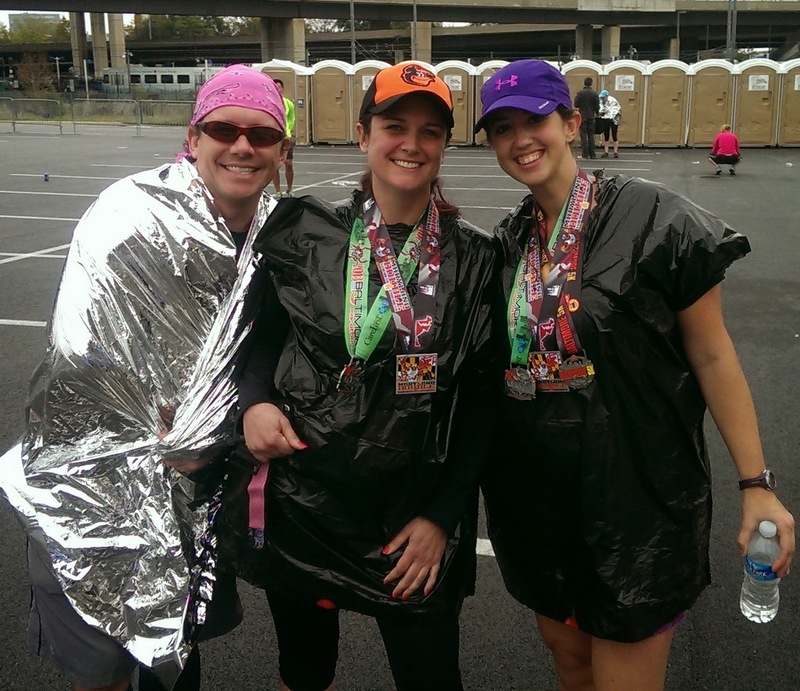 There is something for everyone and all runners/walkers are celebrated. Lots of entertainment, colorful locals, great medals/shirts, and excellent organization make this an event you don't want to miss. PS- do yourself a favor and check out their facebook page. 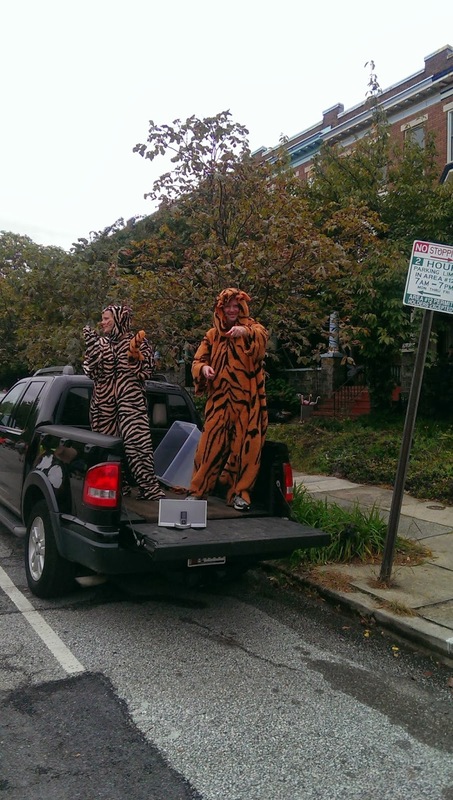 They are responsive, hilarious, and connected to the running community in a way that makes the race so much more than just one day. Before the 5k- just a light drizzle! 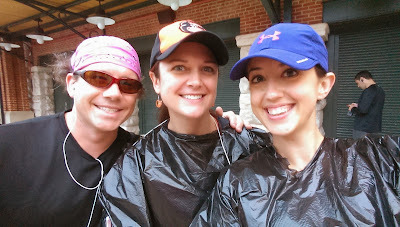 The rain held off until we all finished the half- yay! 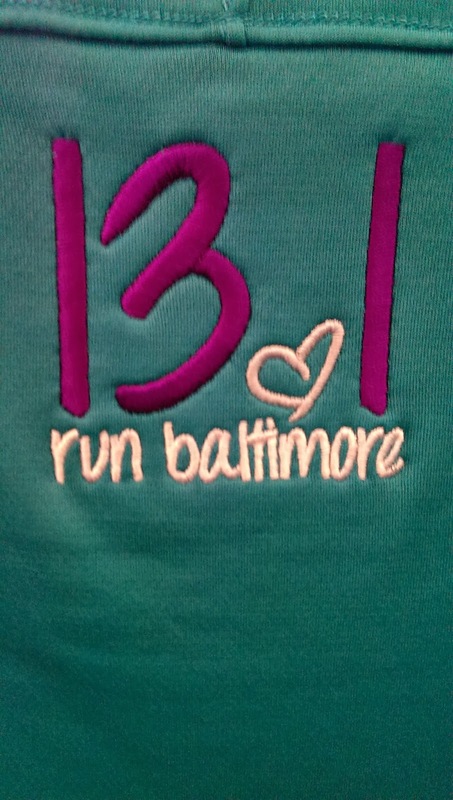 Team Sparkle skirts- much love for our Baltimore sports teams! Done! With the bling to prove it! The perfect running photo: lots of port-a-potties in the background. This is great! I will have to keep them in mind for next year! You definitely should! It was SUCH a fun race! I didn't get to run this race this year (I was on my honeymoon.. valid excuse I guess lol) But I did run last year and completely agree with you. Baltimore Half has been my fav race- second to Disney. I LOVED how the whole city came out to cheer everyone on.. and the signs and costumes were fabulous (My fav was a guy by Lake Montelbello holding a sign that said "smile if you peed yourself" and then he would smirk at everyone smiling saying "yyyeeeaaahhh" lol) Sounds like marathon training is going good! Keep it up! Training Tip Tuesday: Honor the Rest Day!